Qutub Minar : - The Minar (tower) was built in the year 1212 A.D and stands at a height of 72.5 meters in the courtyard of the Quwwat-ul-Islam masjid.This is the oldest historical monument in Delhi and is a must for any visitor to this city. Lotus Temple : - It is the Baha’i house of worship and a fairly recent construction, and is largely admired for its architecture. Akshardham Temple : - Akshardham is a great Hindu temple complex in Delhi. The complex displays millennia of traditional Hindu culture and architecture. 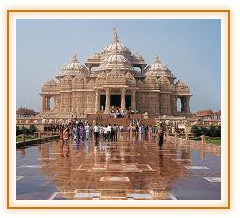 Akshardham attracts approximately 70 percent of all tourists who visit national capital. Also referred as Swaminarayan Akshardham, the temple was inspired by Pramukh Swami Maharaj, the spiritual head of the Bochasanwasi Shri Akshar Purushottam Swaminarayan Sanstha, whose 3,000 volunteers helped 7,000 artisans construct Akshardham. Red Fort : Built by Shahjahan in the year 1639, the fort was a mini city where about 3000 people lived. Rajghat : The memorial built for Mahatma Gandhi who was assassinated by a fanatic, and cremated on the banks of the river Yamuna on 31st January 1948. 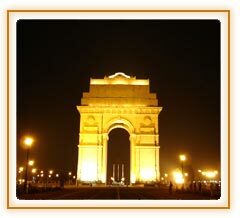 India Gate : Originally known as the All India War Memorial, built in the memory of the 90,000 Indian soldiers killed in the First World War, is a free standing arch with a height of 42.5 meters, designed and built by Edwin Lutyens in 1931. Parliament House : This is a huge circular, colonnaded building where the Indian parliament meets. Rashtrapati Bhawan : Situated on Raisina Hill this was built to be the official residence of the Viceroy, and later became the official residence of the President of India. Teen Murti Bhawan : It was built as the residence of the British Commander in chief in India and later became the official residence of Shri Jawaharlal Nehru, the first Prime Minister of an independent India. 4. Raj Ghat/ Shakti Sthal Veer bhumi Shantivan 45 Minutes 5. India Gate 25 Minute Lunch Break at A. P Bhawan Arr. 02.00 P.M. Dep. 02.30 P.M.
Tour Monday Closed By pass Only # Back to Arr.06.30 P.M.